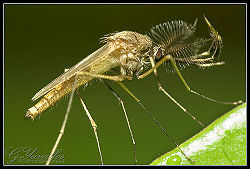 The body of the mosquito like most insects, are divided into three parts (Head, thorax, and abdomen). They also have a tough exoskeleton and six long legs. The head is where all the sensors are as well as the biting apparatus. The head has two compound eyes, an antennae to sense chemicals and the mouth parts called the palpus and proboscis. Only the females have the proboscis for biting. Chemical sensors can sense carbon dioxide and latic acid up to 100 feet away, their prey give off these gases. Certain chemicals in sweat also seems to attract mosquitos. Mosquitos have visual sensors which means that if you are wearing clothing that contrasts with your surroundings, and especially if you move with the clothing, mosquitos can zero in on you far better. To a female mosquito anything moving is alive and full of blood. They also have heat sensors enabling the finding of warm-blooded mammals and birds very easily once they get close enough. The thorax is a segment where the two wings and six legs attach. It contains flight muscles, a compound heart, and nerve cells called ganglia and trachioles. The full life-cycle of the mosquito takes about a month and within that time it undergoes complete metamorphosis. There are four distinct stages of development which are; the egg, pupa, larva, and adult stages. Mosquitoes live mostly near quiet still standing water like puddles and ponds to lay their eggs in or on the water. They usually bite after the Sun has gone down, but there are also other kinds that will bite during the day. The female, which are the gender that bites need the blood for the energy and protein for the development of the eggs. A mosquito resting on a door. A mosquito resting on a leaf. This page was last modified on 3 October 2012, at 16:47.